Need to cover multiple subdomains in ONE certificate? 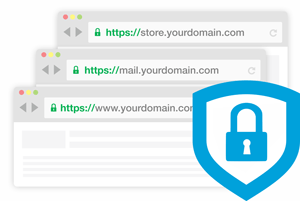 Wildcards are Domain Validated certificates which can be used with multiple websites or hostnames (subdomains) setup on a single top-level domain name. A wildcard certificate for *.iwebz.net will protect www.iwebz.net and cloud.iwebz.net, but NOT www.getssl.in which is setup on a different domain name. All certificates listed here enable HTTPS access which helps improve your Google SEO ranking.